Is there a book on your nightstand? Are there books on your coffee table, kitchen counter, or in your bathroom? Which books live in your desk, your backpack, your car? Which books live in your memory? The Montana Book Festival is interested in your Book Tales, so we're asking readers around the state to share stories about what they're reading, why they read, and what books matter most to them. Stay tuned as we post Book Tales of Montana readers from Hingham to Hamilton, Whitefish to Wibaux, and all points in-between. A true Montana treasure, the ever fabulous Piano Pat lives in Great Falls,MT, where she's been rocking people's socks off for over 50 years at the Sip 'n Dip Lounge. Long before she became a pop culture icon, Piano Pat's socks were rocked by the Bobbsey Twins, a children's adventure book series by Laura Lee Hope, which she read over and over as a girl growing up in Rudyard, MT. She lived vicariously through all of their travels and adventures, and remembers how much she admired the strong relationships that the Bobbsey family had. 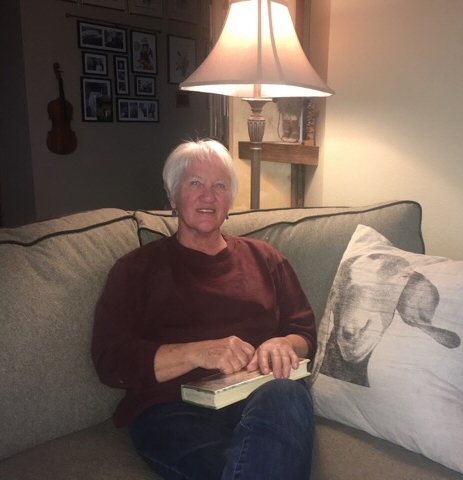 These days, Pat's own family includes a great-granddaughter, Morgan, who reads voraciously at an advanced level beyond her years, reminding Pat of how she would devour books when she was just a girl herself. Barbara lives in Missoula, and recently retired from her long-held post as one of Missoula's beloved booksellers. On hot summer afternoons, Barbara escapes to the cool confines of Department Q., an office in the basement of the police department in Copenhagen, Denmark where cold cases go to die. "Mysteries are just pure escape," she says from behind the pages. "You inhale them." "My mother read to us when we were kids. She had a wonderful dramatic flair and played all the characters to perfection. "She read pretty much all the classic kid books---Treasure Island, Huckleberry Finn, Swiss Family Robinson, etc., but my most vivid memory is of her reading the Ralph Moody series Little Britches. "I rarely read a book twice but one I relished as much (or more) the second time was Marquez's One Hundred Years of Solitude. Magical. "At present, I'm reading Wicked River. It's a history of the Mississippi in the wild days before it was tamed. Fascinating stories about this great artery of early American transportation. "Whose fictional life would I most like to live? Dr. Maturin, multi-faceted physician from the great Master and Commander series by Patrick O'Brian... or maybe (from my younger days) Travis McGee from the terrific mystery series by John D. McDonald. "As a Montana history buff, I want to spread the word about a two-volume, 1400-page set on the homesteading days of Blaine County, titled Unyielding Prairie. It's the work of two Chinook historians, Karen Vellum and Vernelia Tilleman. It took them seven years to complete this colossal project. It's a hidden jewel of Montana history and deserves much wider recognition." Brad lives in Missoula, though he is originally from Murdo, South Dakota. What's a book you've read more than once, and why? "The Lochsa Story, by Bud Moore. It was neat to learn all the rich history of that area, and to read about how they figured out they weren't managing the forest correctly, the changes they made to improve things, and the lessons learned about forest management." Bella says her favorite book is: "Whatever he's reading." What are you reading, Alex? "I'm reading The Wright Brothers by David Mccullough- it's a biography. Do you mostly read biographies? No, I read a lot of mass market fiction- trashy paperbacks-but I also read some nonfiction and history. What made you pick this book up? I think I saw the author on the Daily Show and decided to check it out. Alex mentioned that he works in the technology industry but won't get a Kindle. "All my hobbies are analog," he said. "I like it that way." Cindy lives in Victor, MT. Cindy loves Dancing at the Rascal Fair so much that before she retired, she had a tradition of staying home from work once a year and she’d read the entire book in a day. When her kids got older she said it became a fun tradition for them, too, and they would bring her breakfast in bed as she read. Vonnie grew up in Great Falls, MT, and now lives in Hingham. Right now I am reading The Immortal Life of Henrietta Lacks by Rebecca Skloot. I just finished The New Jim Crow by Michelle Alexander. Tell me about a book that had a significant impact on a particular time in your life. When my husband Jim died, the therapist I saw gave me Mourning & Mitzvah by Anne Brener. It truly helped me navigate through that period of my life. Captain Jack currently lives in Missoula, but he was born somewhere near Ft. Belknap, MT. I’m reading If You Plant a Seed by Kadir Nelson. It’s got very nice pictures, and I like the rabbit on the cover. What is the message in the book that you want to share with fans of the Montana Book Festival? The message in the book is sometimes you have to start with something very tiny and be patient and kind and wait until it grows into something strong and beautiful. My message to fans of the Montana Book Festival is that if we all give even a little bit to the cause during Missoula Gives, something wonderful will grow from it! Well, I’m going to re-read the Clifford the Big Red Dog series, then I’m embarking on a graphic novel adaptation of Finnegan’s Wake. Patti lives in Billings, MT. “I have read this book many times, especially when I needed hope, reassurance, comfort, and a spiritual lift. My favorite quote in the book: 'I do know there used to be a stone in front of a tomb. And I do know it was moved. And I also know that there are stones in your path. Stones that trip and stones that trap. Stones too big for you....Stones are no match for God. Not then and not now. He still moves stones.'" Chad lives in Missoula, MT. What is a book you’ve read more than once, and why? Chad first read the book or a college course on technology in 1991 and has read it several times since.